it makes me think back to bering and wells. 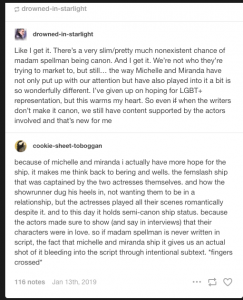 the femslash ship that was captained by the two actresses themselves. and how the showrunner dug his heels in, not wanting them to be in a relationship, but the actresses played all their scenes romantically despite it. and to this day it holds semi-canon ship status. because the actors made sure to show (and say in interviews) that their characters were in love. 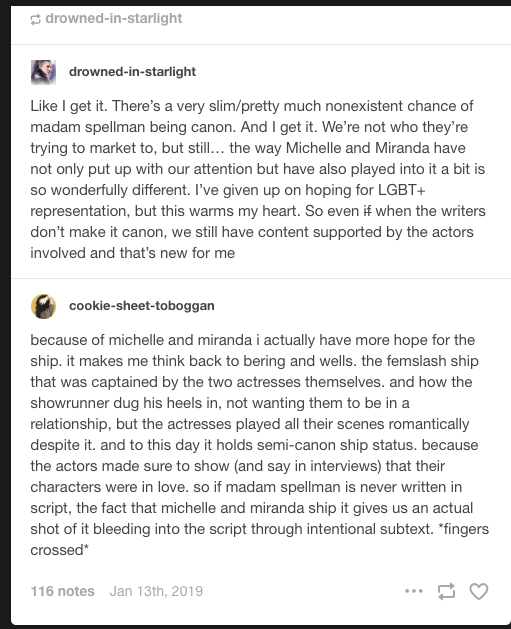 so if madam spellman is never written in script, the fact that michelle and miranda ship it gives us an actual shot of it bleeding into the script through intentional subtext.